Hello, and welcome to my guide on Neith The Weaver Of Fate. Neith has a lot of potential and she has a great damage output. She can have very high dps which makes her a great jungler. First guide so criticism welcome! A Broken Weave appears at the last location that each enemy god dies. The Broken Weaves give Neith minimap visibility and her abilities have secondary effects when used on the Broken Weaves. So basically when ever you backflip or kill an enemy god it leaves a broken weave. You can see around this weave on the mini-map like a ward (but only you can see it). This plays a role in other Neith's abilities. OK so this abilities is one of the strongest apart from her ult. When ever it hits an enemy it does damage then it roots them which is basically a stun but they can use abilities. If there is a Broken Weave on the ground you can hit this and it hits an AOE(Area Of Effect). This is great in team fights because if there's a lot of broken weaves and some enemies around you can room them all if they're in that AOE circle. So this ability is great if you're in a pickle ,or getting ganked. So this heals you if hit an enemy god or creep and it reduces their attack speed. So you can get a chance to use your Creeping Curse or Backflip and the hell outta there. backflip is one the most useful ability you have because you can flip away from your enemies and slow them in the process. It does okay damage but it's great in a Wombo Combo or ganks. You can't jump over walls but you can dodge ults it's 1. Satisfying and 2. Really Useful. Your ult is not the strongest but the most helpful. So lets say you have a fed Loki running away using his sprint through the jungle and your team is chasing him. With this ult 1. You do damage to possibly kill him 2. It stuns him so if you didn't kill him your stun will let your team finish the job. This ability is also good to start fights or stun people at your towers. This also saves people who are spamming [VHH] Help! like crazy. Just target the enemy who is chasing your teammate and you stun them so you can save that teammate and you might get a [VVT] Thanks!. So go do a [VVGW] Your Welcome! The Warrior Tabi are very good boots for Neith. It gives physical damage and attack speed with some added speed. You will need 2 healing potions so you can heal while still staying in lane, it's good to get 2 potions while going back. The problem with Neith is that she can get mana hungry because of her abilities so, get mana potions. Then eventually get Meditation so you can feed that mana hunger without buying mana pots. This is a good buy if you have extra money and you are going ageist tanks or if you're lacking in the damage department. This is a really good item for jungling and clearing minion waves. It damages creep or gods who are around the person you are hitting for reduced damage but its a really good item. Plus krits are more frequent with this item. This is another good item against tanks because it has damage penetration and it reduces the enemy's physical protection. Soul Eater is one of the best life steal items. It has some much-needed health while having some attack speed. Plus some lifesteal you can use to your advantage. Deathbringer makes krits have more damage and a bit more frequent, with a little added physical damage. Rage is personally one of my favorite items to build with and with Deathbringer makes the krits happen like no tomorrow. If your fed this is one great consumable to get. It's 3000 gold but if your fed up the wazoo you can get it no problem. It's a straight upgrade from Potion of Physical Might and will get you even more kills than, before because of the physical power it comes with. This is great for escaping battles you can't win. If you are trying to escape use backflip first then sprint the hell out of there! This item is used for 2 things. 1. Running away from enemies so they can kill you, or 2. Slow the enemy so they can't run away from you. Plus this goes great with sprint. Use it wisely. meditation is a great ability to solve mana hungriness. It heals 75% of your mana which is a lot better than having no mana. This item is good for being mid because that means you can stay in lane longer and get more gold. __Don't be so aggressive with Neith when using an all damage build sure, she can do a lot of damage but she doesn't have a lot of health. She's very easily targeted by someone who can stun/ slow so be careful and backflip & sprint away to safety. She doesn't have really good lifesteal than lets say Kali so you can't really solo fire giant, but you could solo gold fury later in the game. __Neith can deal a lot of damage, but she's quite squishy. That means use your abilities, get the kill and get out. When looking for a laining partner tanks are the best choice so they can tank the damage for you while you deal the damage. When laining always backflip at the jungle entrances so you can use Broken Weave to use it as a ward. Also backflip at where the minions clash or where your enemy would be so, you can Spirit Arrow the broken weave and make an AOE root. 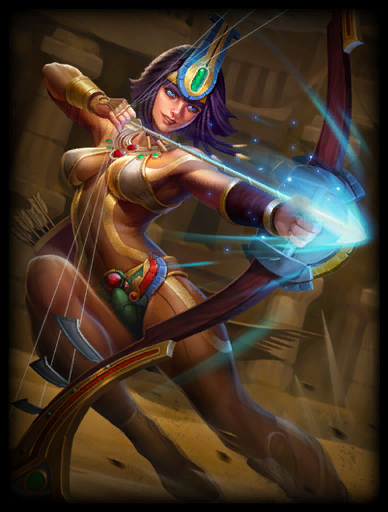 __Neith has a good damage output and Golden Bow together make her a great jungler. While jungling she can gank really well. From behind she can backflip to the enemy god and while chasing. First, root them with a Spirit Arrow then auto attack them, if they try to fight you can use Unravel to gain any lost health then activate Creeping Curse. If they happen to get away you can use World Weaver them to finish them off. __With the damage out put and thegold bow for clearing minion waves makes her a great mid. She can do damage to either kill the enemy who's mid or send them back so you can get more gold. More gold = more items, more items = more damage, more damage = more kills, more kills= enemy re-spawn time, enemy re-spawn time= no-enemy in lane, no-enemy in lane= push harder, push harder = Minotaur kill, Minotaur kill = Win! It's a glorious cycle. Remember she's stronk but she's squishy so don't be so aggressive, also she's an easy target to gank. She can have very high DPS and with the use of her abilities she's a very great jungler and ganker. Her ult is very useful and a teammate life saver so use it for good not for glory (Don't use it just to kill, use it to save). Use your Broken Weave to your advantage use them like wards and backflip where you would place a ward. I hope this guide has helped you, and if you could help me by giving me some constructive criticism. Thanks and good luck playing Neith The Weaver Of Fate! Add more content. This is amazingly done in terms of decorating it. Already up voted. Nice one. 8140 Ragingstorm Add more content. This is amazingly done in terms of decorating it. Already up voted. Nice one.